Not an official Club event, but a number of people will be meeting up at the Portillos in Schaumburg on the first Wednesday of each month in the summertime. This is a great chance to hang around for an evening, kick tires, have some good food, and socialize with MINI friends. Add a comment if you are planning on attending so we will look for you.. If anyone is interested in making this more than just a social gathering and want some kind of focus to one of these gatherings, let me know. I am very open to suggestions. Will try to make it I need to focus on a chili cheese dog. Weds I’m supposed to work late but might change my schedule. Might be on the Vespa or in the Golf. Maybe in the Mrs’ Mini if I can get her to join. Just entered it into my Crackberry. I’ll be focused, I think. Will try to make the July and August sessions. Jeff, Thanks for arranging these meetings. I’ll bring mine up this Wednesday…. Should have the new wheels on it by then… Hopefully!! Sorry I can’t make it. Need to see Tom Petty. I will try to make it next month for sure. See Ya This Wed, July 2nd, at Portillos in Schaumburg across from Patrick MINI. Be one of the 1st to see a new product from AutoXCooper. Will try to make it tomorrow July 2nd. The Weather gave us 2 fun hours to eat and hang out with our MINI friend last night. Only 5 MINIs braved the weather, hope to see more of you next month, same place, Aug 6th. and, heres a link to the new product. It only sounds like a small handfull of people will make it. Weeknights are much tougher for me to make events..
Last night we had 8 cars and 9 attendees. Unexpectedly Brandon, a new manager for MINI USA, stopped in and we asked him to join us. He is new to the Chicago area and decided to stop by Portillios. 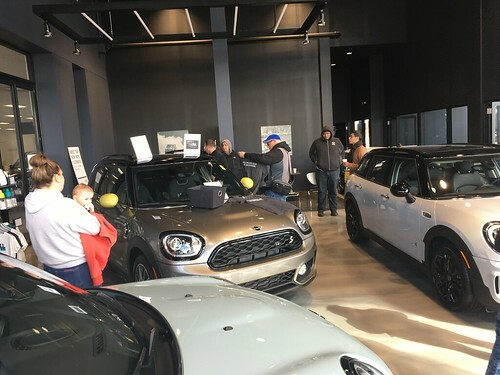 We hope to see more of Brandon, who has quickly become a MINI enthusiast, as well as other members of the official MINI family, both corporate and from the dealer network. We had a great time Wednesday night. Good to see everyone who came out for the next-to-last Portillo’s gathering of the year. Our last meetup will be 9/3.